Today is Guru Purnima. This holiday is to celebrate the Guru and it is honored on the full moon in the month of July. It is a widely practiced holiday amongst Buddhist and Hindu culture and is in place to give honor and respect to the spiritual teachers of the global community. In Sanskrit, the word “Gu” is translated as darkness or ignorance. The word “Ru” means dispeller or remover. Therefore one who removes darkness and ignorance is considered Guru. The Guru/disciple relationship is regarded as a necessary part of life to help guide us through the many challenges that we face. On Guru Purnima, disciples offer puja (worship or offering) to pay respect to the Guru through devotion in the form of flowers, song and/or prayer. 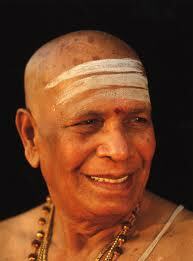 When I began the practice of yoga I longed to meet a genuine Guru. I had been reading several accounts of travelers going to India to meet spiritual guides and had taken diksha (initiation) into the Guru/disciple relationship. I was completely intrigued by this concept. I had heard accounts of different experiences where people felt as if their lives began to open in a direction where they experienced peace and acceptance of their experiences in life. During this time sparked interest in discovering what my purpose was. The main story that stuck with me was the adage that “when one is ready, the Guru will appear.” I began to trust that this was true and to try to let go of the wanting right away. This in itself is a large part of why there is dissatisfaction and confusion to begin with. Wanting things to happen right now without facing the difficulty that comes with working through our issues can be the catalyst for confusion. Hence, the understanding of the journey with patience in practice began. Fast forward to the first time Tamara and I traveled to India. We had heard amazing things about a man named Shri K. Pattabhi Jois who taught yoga in a town called Mysore in South India. Over several years of hearing accounts about him and after speaking with many people who had traveled to India to practice with him we became inspired to go and visit him ourselves. It was eight years ago and we had just finished a month of Ashtanga practice with Rolf Naujokat in Kho Phangan, Thailand. 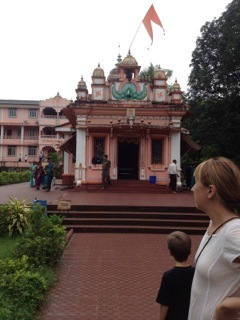 We made the journey from Thailand to India by boat, plane and car and began practice at his shala in Mysore. Right away he struck us as an extremely compassionate and gentle man. He also carried a “light” about him that was quite intense and direct. He could command complete respect with his voice and presence and then with a look melt you with the innocence of a child all within a moment. This sparked so much intrigue and interest for me to get to know him more. At the end of each class his students would line up and kneel down and touch his feet. I was so unsure what to make of this act. This was a foreign concept to me being raised in American culture, creating a unique challenge and an internal struggle regarding my own sense of surrender. Several weeks went by and one morning I felt the inspiration to join in line. As I got close my palms began to sweat and I felt a bit nervous. Why was I so nervous? I kept asking myself this question because it didn’t seem like such a big deal, I am just showing respect for my teacher. My turn came and I knelt down and touched my hands to his feet and placed my forehead on the ground just below. I looked up at Guruji and he had such a gentle smile on his face and this resonated deeply within. Now an even stranger feeling came over me…I immediately broke down into tears. This feeling of catharsis was a necessity to move forward with surrender and humility. Feeling a bit shy, I slowly retreated and tried to remain as quiet as possible to try to assimilate this experience. It was at that point that I began to understand and appreciate the depth of the Guru. It is because of that point, that I continue to aim to cultivate this type of respect for the teacher. It is through the practice of humility as a student that we can truly appreciate the grace of the teacher. Guruji passed away several years ago. Yet his teaching and his presence is alive and thriving today. There are several senior Ashtanga teachers who were dedicated students of Guruji that continue to teach and instruct through this method. By virtue of dedication to practicing yoga, which is really quite simple, the essence of the Guru remains alive. Yesterday, following practice with Rolf, there was such an ease of conversation that it felt that there was really no need for conversation. A simple namaskar(hands in prayer and gentle bow) and a smile can convey everything. When we begin to contemplate what Guru yoga is and how it applies to our own lives it can bring up a lot of inquiry and question. I feel this is a completely personal journey for each individual and that there is no exact formula that works exactly right for each person. By the same token, there is a wonderful formula that can work for every person and it begins with humility. 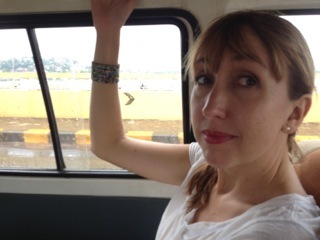 On our first trip to India I had asked a taxi driver, “do you have a Guru?” He replied, “Everyone is Guru. We can learn something from everyone if we choose to truly listen.” This is profound Indian taxi cab wisdom. My teacher Tim has often said something that seems to sum it up nicely. He says “My goal as a teacher is to inspire a passion for practice. The practice itself, done consistently and accurately, is the real teacher.” This is a wonderful outlook! It was a Friday and we woke up early and practiced Lead Primary series with Rolf. He counted with such fluidity and ease through the Primary Series. Practicing to Rolf’s count is just like practicing with Guruji. It was a pleasure to listen and move with every count and coordinate the movement to his timing. The choreography of the ashtanga vinyasa method is so complete and exact it is a great to experience in detachment and inward focus. 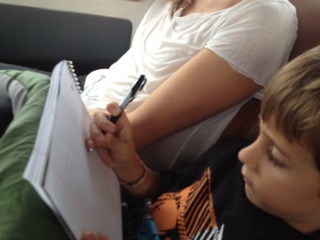 Those of you interested in learning more about Rolf can by visiting his website at www.yogabones.org. 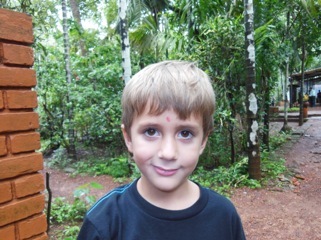 Following practice and breakfast we prepared for our trip to Ponda to visit some of the famous temples we have heard about. 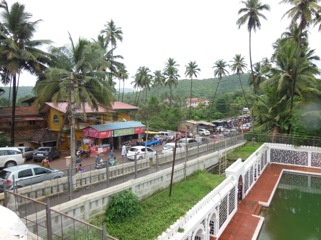 We left the beaches of Goa and travelled through the capital city of Panaji we past the lowland river and estuary region of Goa and began to climb in elevation the tropical hillside of the inland region. The country side is a dense jungle of coconut palms, bananas, mangos, cashews, and Flame of the Forest trees. 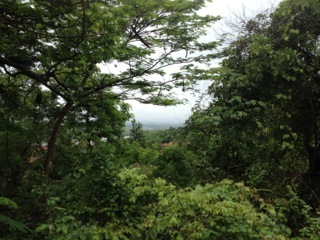 In the local Konkani language the names of these trees in order of above are called Naal, Keli, Ambo, Caju and Pongaro. 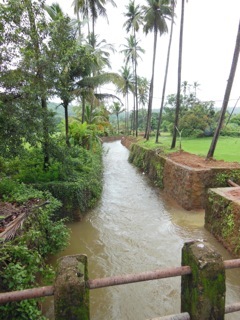 There are several plants and trees that are unique to Goa and also some that have been introduced by the Portuguese. Interestingly enough, the Portuguese introduced the green chilies, which is now an essential ingredient of the Indian Curry. 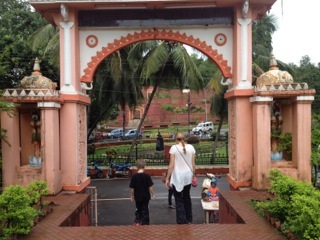 The first temple we stopped at was a Sai Baba Temple in Raybandir. 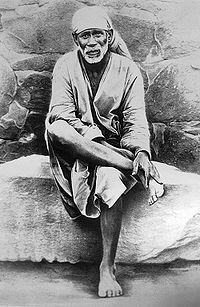 Sai Baba of Shirdi is considered a saint in India and he is much revered across the country and also throughout the world. He had no love for perishable things and his sole concern was self-realization. He taught a moral code of love, forgiveness, philanthropy, charity, contentment, inner peace, and devotion to God and guru. Sai Baba opposed all persecution based on religion, caste or creed. He was an opponent of all religious orthodoxy existent in Christian, Hindu and Muslim circles. Although Sai Baba himself led the life of an ascetic, he advised his followers to lead an ordinary family life which rings true for me. What we really enjoyed about this temple which was quite unusual, was that there was no one there. There were tables in the entry with some flowers and incense available to offer as pujas yet there was no one in sight. This created a very quiet and spacious feel when inside. Common practice is to sit on the floor with crossed legs and avoid placing the soles of the feet toward the front of the room. Most Indians are completely at home sitting with crossed legs which we often call “Indian style” sitting. In sanskrit this is called Sukhasana. This translates as easy pose and literally means “good axle hole.” Imagine you have a wheel that has the axle hole placed exactly in the center. This creates a smooth and even rotation. Crossed leg sitting can become very easy yet for many of us westerners used to sitting in chairs, sukhasana quickly turns into “dukhasana or suffering pose.” Yet another reason the yoga practice is so beneficial. We continued onward inland and when we reached the crest of a steep hill, turned right and made a steep descent down a winding rode alongside someones pineapple patch to arrive at the Balaji Temple in Sansthan. Balaji is another name for Venkateswara which means “the lord who destroys the sins of the people.” He is an incarnation of Vishnu, who in the Trimurti (“three forms”) of Hindu culture serves as the aspect of sustenance and preservation. The great thing about visiting during the “off season” is all of these sites are very quiet. Only a few people are visiting allows for a peaceful stroll around the temple. I was told that this temple is a smaller version of a famous Balaji Temple in Andhra Pradesh for which thousands of pilgrims will visit within a day. 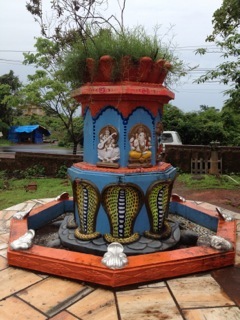 We offered pujas to the brahmin at the entrance for which he gave me some blessed water to drink and also an ayurvedic herb to chew on which had a mouth numbing quality. We also bought some prasad which literally means “a gracious gift.” Prasad is usually a food that is first offered to the deity and then given to the follower to serve as “a good sign.” Beside the temple was an ashram where devotees could stay and at the top of the ashram was a beautiful statue of Shankaracharya. 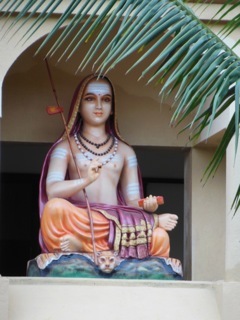 Shankara was born in 788 A.D. and is considered one of the greatest philosophers in India and is given credit for establishing the tradition of Advaita Vedanta. Advaita (literally meaning non-duality) is a system of thought where the identity of the Self (Atman) and the Whole (Brahman) are one. Realization of this identity leads to liberation. Practitioners of this understanding subscribe to the notion of jivanmukti which means “living liberation.” In other words, it is possible to become fully enlightened within the framework of human existence. Whereas dualistic philosophy states videha mukti which means “liberation without the body.” In other words, it isn’t until the time we pass, or death, that we are able to realize full liberation from the confines of illusion within our consciousness. 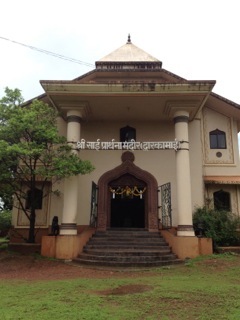 Next we are off to the famous and enchanting Mangesh Temple in Mangeshi. 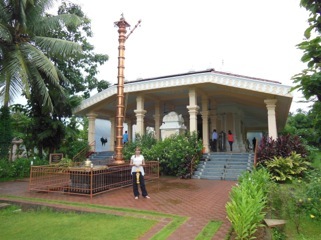 This is temple dedicated to Lord Shiva and has an interesting history. Its original location was in a village called Kushasthali or now known as Cortalim as named by invading Portuguese. 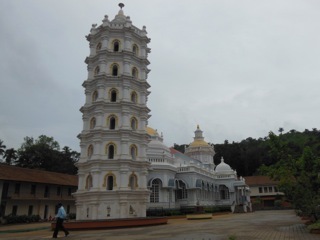 In 1560, the Portuguese started Christian conversion and hence the Mangesh Linga was moved from Kushasthali inland to its current home in Mangeshi. The former location was demolished and a Christian church now stands in its place. In 1739 the current temple was built to greater grandeur and by the time the Portuguese had moved into this area their religious zeal declined and they began to become tolerant of other religions. 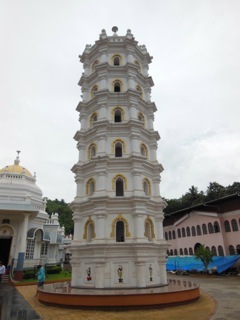 The temple is simple and yet exhibits an elegant structure. I had read before hand that westerners were not allowed to go into the temple any more because of lack of respect for proper dress code. Women must cover their legs and shoulders and men must wear long pants. It is also imperative that no one enters if they are under the influence of intoxicants. So I was quite pleased when we followed the rules and were allowed entry. No photography is permitted inside which leaves the inner sanctum to ones imagination. 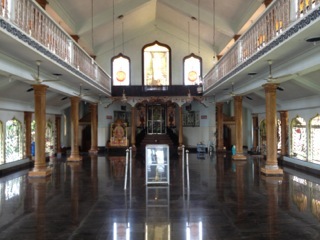 We sat on the floor with quite a few other Hindu families and enjoyed the excitement that the temple inspires. We offered some pujas gave some American coins to an interested resident brahmin within the temple. We bought some japa malas (108 beads strung together) from him and listened to his history of the temple. 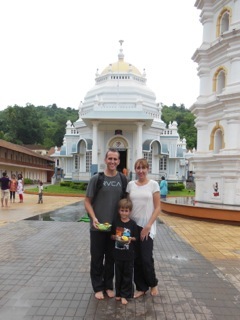 I had promised Ethan that we would only go to three temples today. I bartered for five and he tried for one so we compromised in the middle with three. 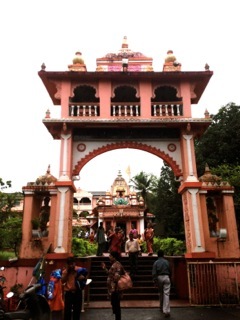 So when Ulhas dropped us in front of the fourth temple for the day I was excited when the family was keen to jump out of the van and dodge some traffic to visit the Shri Ganesh Temple at Farmagudi in Ponda. Ganesha is elephant headed and boyish body incarnation of Lord Shiva who is widely revered as the Remover of Obstacles. We removed our shoes at the steps below and entered through the doorway. Once inside there was a large Ganesh statue locked behind the entryway doors. Oil lamps were lit all around and grand garlands of flowers adorned his body. The smell of incense was strong and permeated the halls. The tradition is to walk clockwise around the the square building that houses the statue. On the back of the wall that would be to the back of the idol devotees press their forehead against the wall. Because thousands of people have done this millions of times the wall gets worn away and leaves the most interesting texture and abstract artistic color. I followed suit and rested my face on the wall and it put the most interesting and bizarre sensation on my forehead. I tried to wipe it off because it felt unique and it was gone just as quick. A scientist would probably say that some bacteria caused irritation for which I won’t argue, however it was something to note. 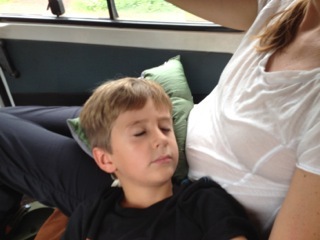 We exited the temple and hopped back in the van and gave some time to let it all soak in. It was time for lunch at this point in which we went to the more well worn tourist path of the Sahakari Spice Farm in Curti Ponda. We enjoyed some tasty vegetarian curries, butter naan(Indian bread) and washed it down with lemongrass tea. 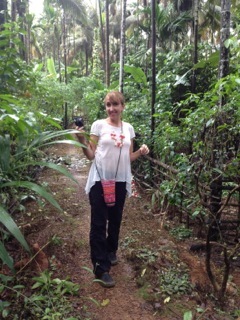 The spice farm offers a tour through their spice fields which are a jungle of different plant species. 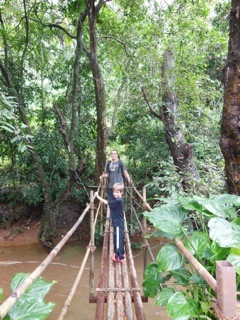 At this point we were more interested in walking around by ourselves which we did to enjoy the forest at our own pace. We joined back up at the van with Ulhas and began our journey back to the beaches of Candolim. It was a pleasant ride from the heights of the hinterland back down to the busyness of the coastal surrounds. The longer we spend in India the more we begin to settle into the pace and culture. When we first arrived everything is moving in a way that was unfamiliar and then each day brings a new discovery, a wonderful meal, a temple visit, an introduction into a different perspective that slowly becomes more familiar. I am beginning to have that feeling like I would like to live here. I mention this to Tamara and she just looks at me with that smile that reminds me to just enjoy the moment. Each moment we have where we are right now is the perfect moment to enjoy our own temple within and spice of life around. As we keep traveling a large rain storm begins to wash everything down. The heat breaks and makes for the perfect environment to sit back and enjoy.